While you’re out doing your Christmas shopping, pick up a plastic top hat at the party supply store to fill with chips, add a couple of martini glasses (these are inexpensive acrylic) to fill with your favorite dips. Mmm . . . maybe guacamole and salsa or humus with some pita chips. There you go- you’re ready to ring in the new year without any additional stress – unless of course the party is at your house and you have to do the post-christmas overhaul . . . 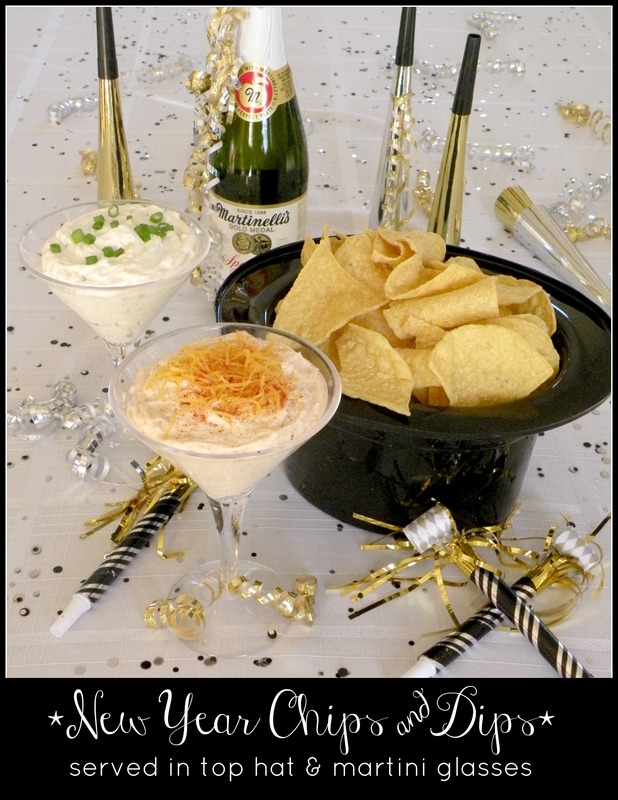 Simple, Yummy, and So Fun – what a great addition to your New Year’s Celebration! Good luck with all you preparations . . . don’t forget to relax and enjoy the season! PS – if you haven’t enter our Outback Steakhouse Giveaway there is still time, but hurry- contest ends December 16!! How about a good steak and some of that yummy bread . . . maybe a bloomin’ onion? I LOVE this- you just solved my New Year’s dilema of what to take!!! Thanks hope you have a Merry Christmas! I am so doing this for New Years- Love it! CUte Idea – making this for New Years!